After yesterday's yucky, rainy weather, it was nice to be back out in the field today and doing some preliminary scouting for our New Year birding walk on January 1st. Though we have had the odd cold snap, this winter has so far been pretty mild, meaning that a good range of birds can be found around Cape May right now. Of course, right up at the top of the list of targets for January 1st will be a Snowy Owl and, with perhaps five birds still around in the area, there's a reasonable chance that we will stumble across one. Ducks will no doubt feature strongly too, and with the weather looking chilly but dry over the next couple of days, hopefully there will be no big freeze to push birds off the Cape May Point ponds. Today, I found Redheads at two locations, including four males and a female at the state park, while Hooded Mergansers and Buffleheads were in full display at several sites. In The Rips, a good movement of Northern Gannets, Long-tailed Ducks and Surf Scoters was taking place this morning, a Bald Eagle made a fine sight as it headed out (over a Snowy Owl!) to hunt and Purple Sandpipers were on the jetties. Two Western Kingbirds look set to spend the winter with us (if the weather holds) at Cresse Lane, off Route 9 in Erma. The birds favor the edge of a vineyard at the east end of the lane, just north of the wildlife management area. Please note that this vineyard is private property and should not be entered without the owner's permission - I hear that one or two visiting birders have recently forgotten this common courtesy. Other recent birds include a Ross's Goose with the Snow Goose flock north of Reed's Beach on 26th (which may still be present but this is a difficult site to view), Orange-crowned and Nashville Warblers and a Common Yellowthroat at Cresse Lane on 27th and a White-winged Dove at Cape May Point on 27th to 29th at least. A Rufous Hummingbird also continues at a feeder at Cape May Point. 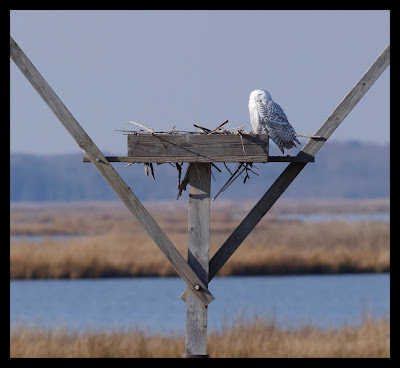 Snowy Owls continue to delight birders along the Jersey Shore and offer us a great opportunity to share some great viewing with members of the public. This male has put in a few guest appearances around Cape May Point over the past 10 days or so but mostly seems very good at staying out of the limelight. While much media concern continues to get people stressed over the plight of these 'starving' birds, studies of trapped birds have shown them to overall be fit and healthy [photo by Mike Crewe]. These two female King Eiders have been hanging around the free bridge at Nummy's Island for some time and hopefully will continue to do so into the new year [photo by Mike Crewe]. One of two Western Kingbirds that have been along Cresse Lane in Erma since at least December 15th [photo by Mike Crewe]. This White-winged Dove was an unexpected bonus to the end of the year and has most often been seen along Harvard Avenue, Cape May Point since it was first discovered on December 27th. It was quite a few feathers missing from the left wing so may perhaps have clipped an overhead cable [photo by Mike Crewe]. As if to highlight how mild it has been, this group of Tree Swallows, resting on the South Cape May Beach was part of a flock of 24 birds seen there on Christmas Day [photo by Mike Crewe]. With the CMBO offices closed between now and New Year, booking for our January 1st Kick off your year list walk is tricky - and there are still just a few places left. If you wish to attend and haven't booked yet, you can show up at Cape May Point State Park for a 10AM start, but do come with cash in hand to pay on the day. Having been away for a couple of weeks, it's hard slotting back into the good old regular routine, so I'll start with a quick apology. Of course, this being Cape May, you can be sure that birds have been out there to be found in South Jersey and there has been much to enjoy. 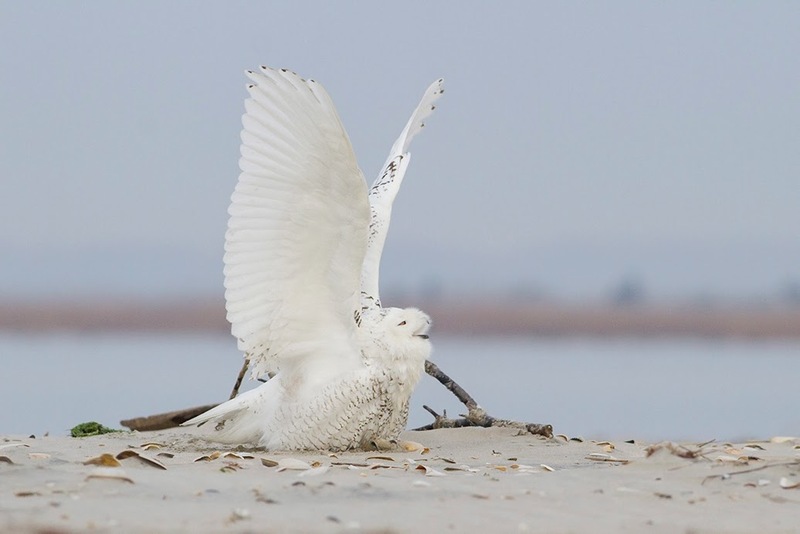 Primary on the minds of most folks has been - without question - the continuing invasion of Snowy Owls along the eastern seaboard of North America. Much has happened since we last posted on them and the fact that so many people are not only looking for, but reporting, these birds has meant that we may yet learn much more as the winter progresses. 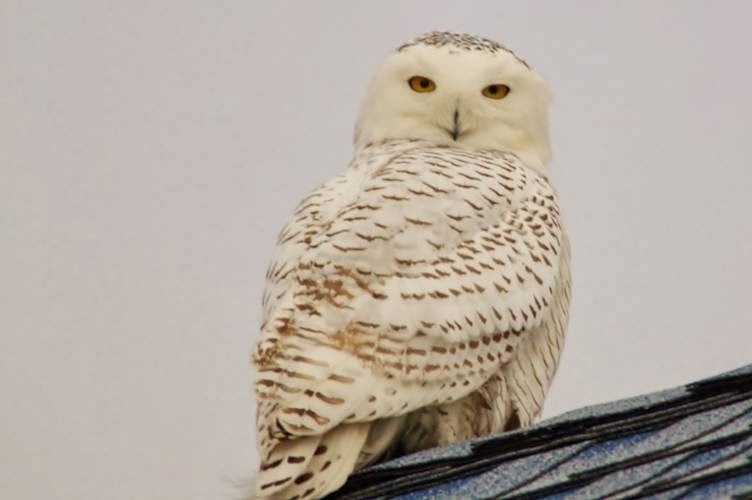 We encourage anyone seeing a Snowy Owl to get into the habit of entering the sighting into eBird, where data collected can be made available to those who are studying this notable movement of birds. If as many sightings as possible are lodged in a single place, rather than scattered across any number of different forms of media, it will be much quicker and easier to make sense of what is happening. At the simplest level, studying photos of birds has allowed us to follow the local movements of a few birds. Further afield, a bird was trapped and had a satellite tracker attached; these pieces of kit cost over $2000 so we're not going to see too many of these out there, but the information so far received has already clearly demonstrated how much some of these birds are moving around. The bird was tagged at Assateague Island on the Maryland coast and has since moved north to Cape Henlopen, Delaware, across the bay to Cumberland County and was last reported from Cape May County. Cearly this bird is not just moving in one direction. You can read more about this story here: http://mdcoastalbays.wordpress.com/2013/12/21/the-snowball-effect-of-project-snowstorm/. As for our local situation; the last time I checked, there was still at least one, perhaps two, Snowys in Cumberland County, possibly up to seven in Atlantic County and around five or so in Cape May County. With no shame what so ever, I present here yet another set of awesome photos of Snowy Owls, photos that have been sent to me over the past couple of weeks by people enjoying these wonderful birds. If you still haven't been out to enjoy the bird that the Inuits call 'Ukpik' then it is likely that birds will be around for a while yet. Both CMBO through our regular programs and Scott Barnes and Pete Bacinski through NJA's All Things Birds programs will be running a series of winter birding programs that offer a chance to enjoy the great owl of the north; if you want to treat yourself to the very best of starts to the New Year, check out our January programs, book yourself a place and we will see you in the field! 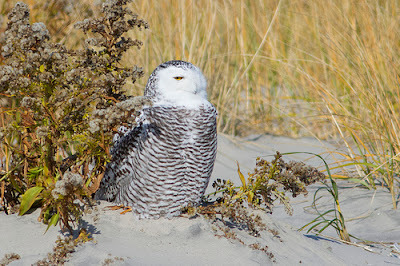 Shiny white male Snowy Owls might be more immediately eye-catching, but beautifully marked females such as this bird at Stone Harbor Point have a magnificence all of their own [photo by Joe Debold]. As well as the open beach fronts and dunes of the barrier islands, it is worth checking all those Osprey nesting platforms that you can see from the boulevards across the marshes. 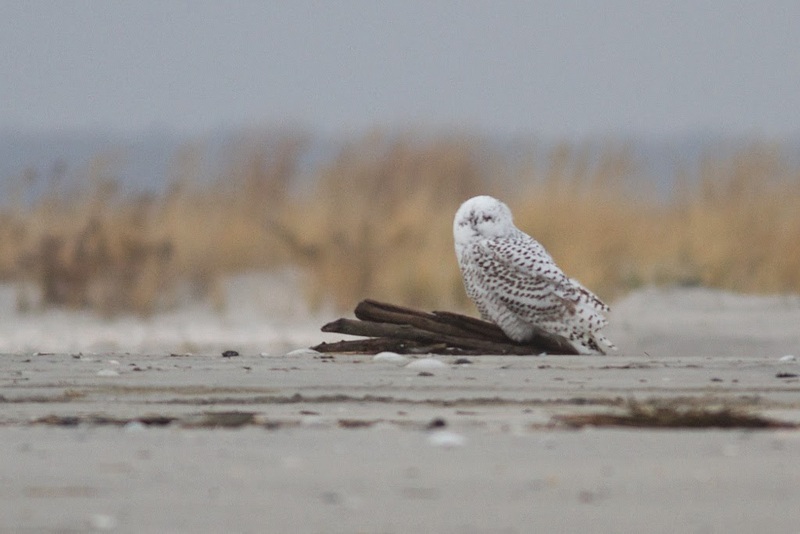 Here's one idling away the daylight hours on a platform at the Forsythe NWR (Brigantine) recently [photo by E J Nistico]. This second shot of the Two-mile Beach bird reveals that this bird was at Stone Harbor Point back in early December and is one of two that I posted pictures of from there on this blog on December 2nd. Note, especially, the tail pattern and the pattern of the lower scapulars (sorry for being technical!) [photo by Lambert Orkis]. You could easily be forgiven for thinking that the Snowy Owls have driven all the other birds out of New Jersey, such has been their grip on the world of bird news - but far from it (though conversely, I noticed in town today that it is impossible to find a fluffy Snowy Owl gift anywhere in Cape May right now, but there's plenty of other species to choose from!) So what else has been happening? Well, most recently, the local highlights have included up to two Western Kingbirds at the eastern end of Cresse Lane in Erma, two female King Eiders that have been hanging out at the free bridge at Nummy's Island and - briefly on 19th at least - a male Harlequin Duck at Cold Spring Inlet. The 2013 Avalon Seawatch finished on something of a yucky day of wintery rain and wind yesterday and massive thanks are due to Calvin Brennan for carrying out this sometimes demanding, but essential, count. Razorbills put in a good appearance towards the end of the count last week as well as a scattering of Redheads and Canvasbacks. 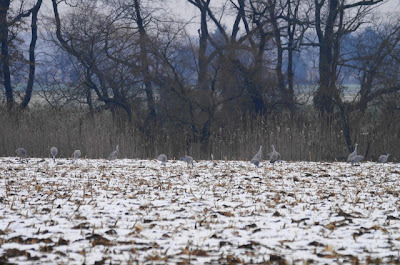 News on the six Sandhill Cranes seems to have dried up of late, with the last report I heard of coming on the 17th, but they may still be in the area. 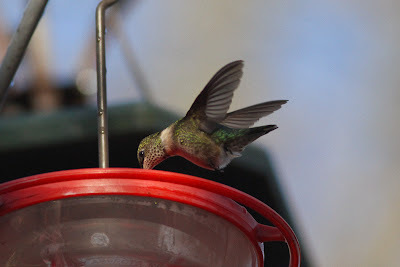 Other news includes continuing late hummingbirds at a number of feeders - with Ruby-throated Hummingbirds competing with Rufous Hummingbirds to be last of the year. A Baltimore Oriole was at a Cape May Court House feeder on 22nd, a presumed escapee Whooper Swan continues to be reported along East Moss Mill Road in Atlantic County and a Laughing Gull was at Sunray Beach on 23rd. 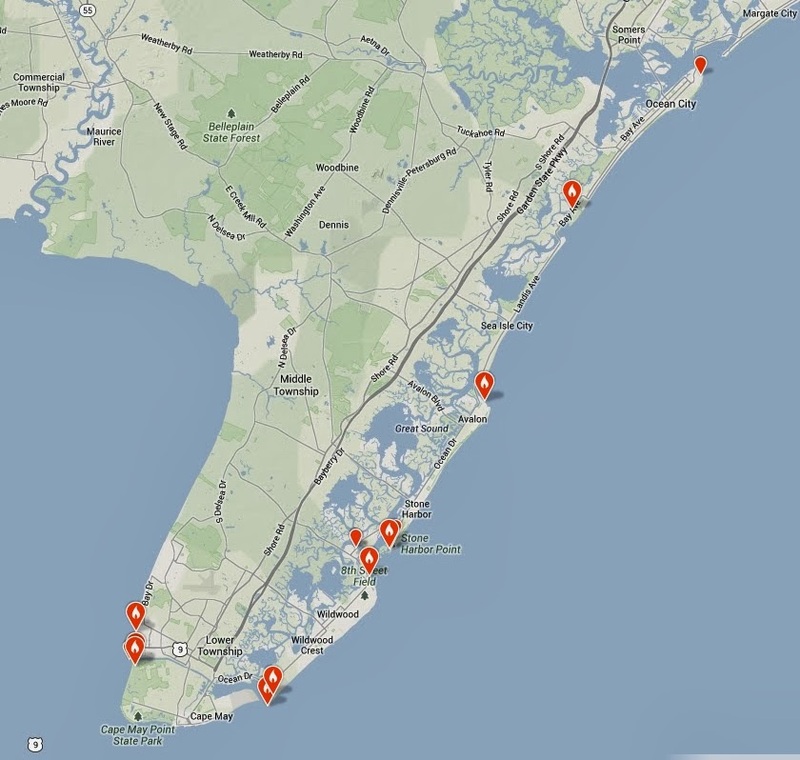 It seems that it is not just Cape May that has had a recent influx of Sandhill Cranes. 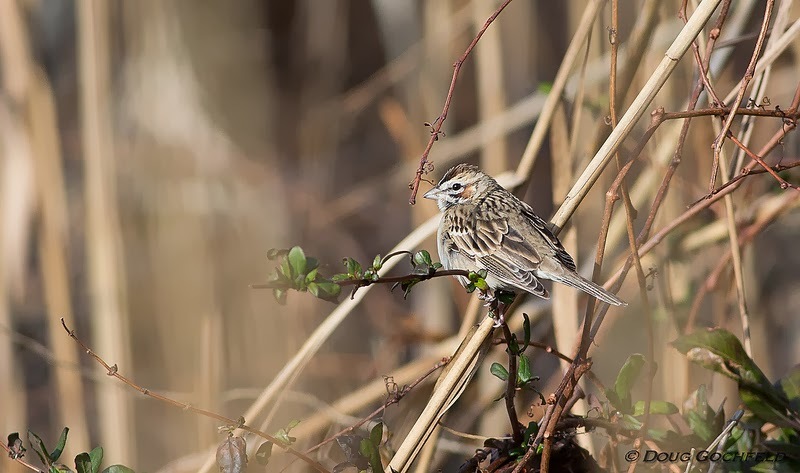 Though small numbers of these birds have been established in Salem County for some time now, there has been a marked increase in number of late with perhaps 10 new birds having appeared. This photo shows 13 of a flock of 16 that was around mid-month [photo by Jeff White]. 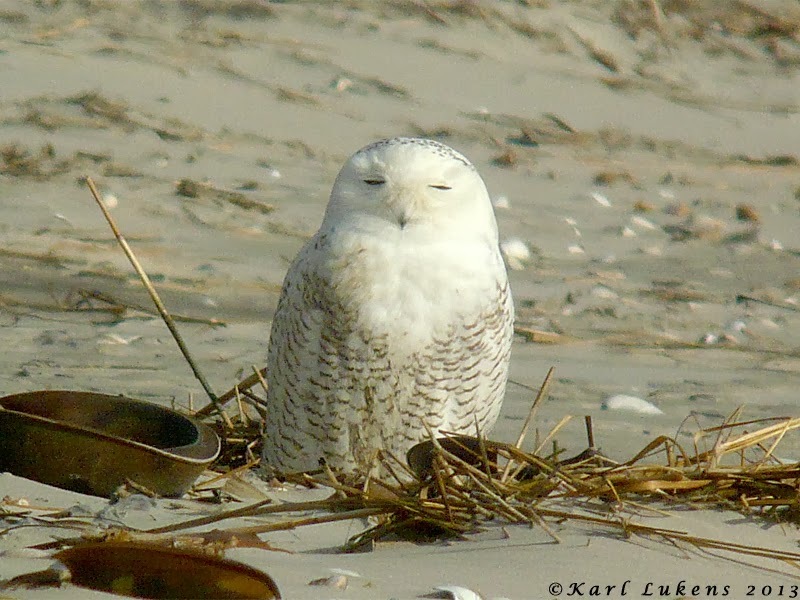 Another year, another Cape May Christmas Bird Count under our belts. The weather was better than expected- the system that went through our area cleared out in the early pre-dawn hours of the morning, enough so for us to find some owls hooting around! A brisk West-North wind all day kept the birds and trees as well as birders moving. We were able to get a couple new birds species for the count regardless, and plenty of hot soup, good food, and socializing to end our day together with a tally of the days' yield. Without further ado... The list! 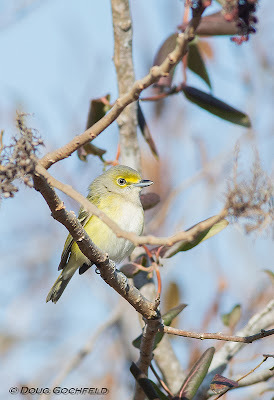 One of three Orange-crowned Warblers at Cape May Point State Park the day before, a normal wintering number. 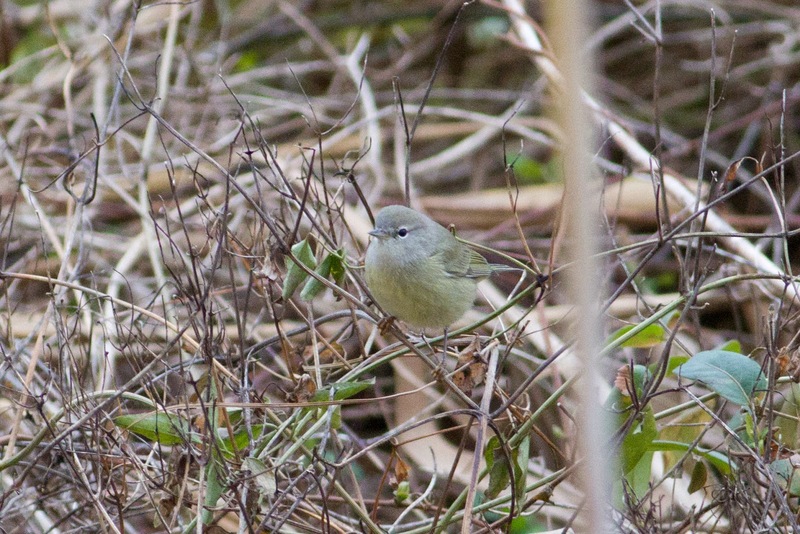 The Coast Guard Base yielded four Orange-crowned Warblers on count day. Ever since the first Snowy Owl showed up at Stone Harbor Point, I've gone there with friends everyday to see our arctic visitors from the north. I've had the pleasure of being in the presence of these regal creatures for a number of hours lately and I can't help to be transported to another place- the high arctic, where trees are non-existent, and tundra goes to to the horizon. Imagine what they have seen- what normal life is like for them day-to-day, and how out of place they must feel living on the Jersey shore for the time being. 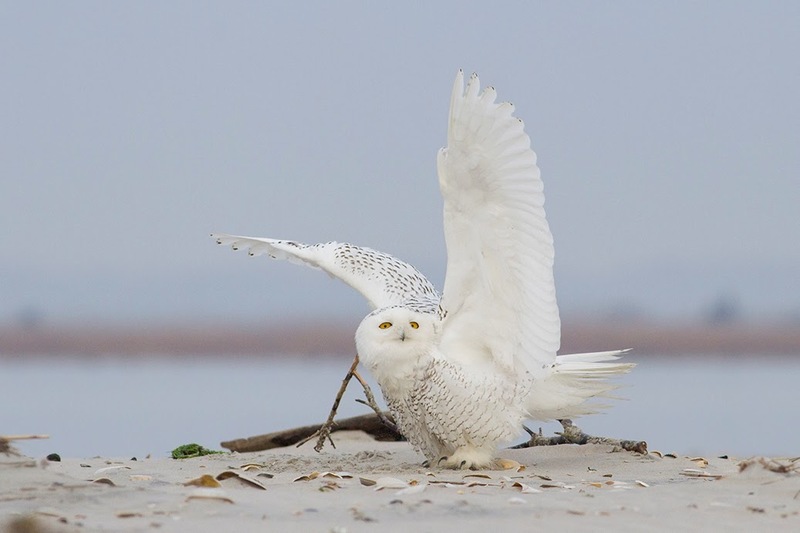 Being out of place for any bird comes with it's own challenges of finding food to eat and not becoming food themselves, even for top predators like Snowy Owls. The morning trot out to the end of the point. lasted a few short minutes before it rose above the clouds. Life is best with no filter- you never know what the day will bring! 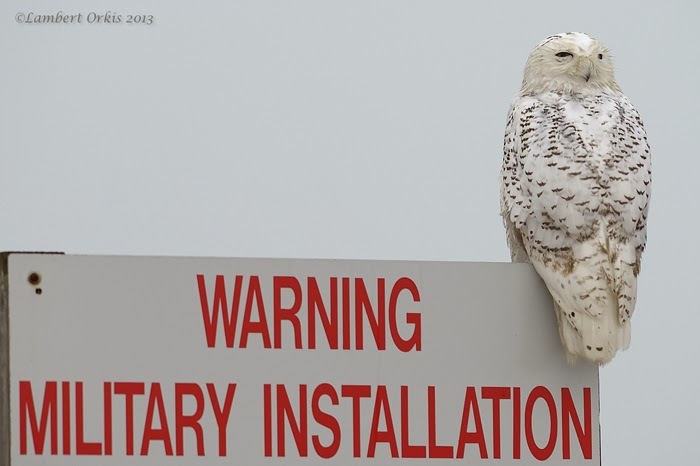 2013 the trend is finally on the rebound which is good for our winter raptors including Snowy Owls. have been patrolling Stone Harbor Point this winter. zeroed in on the Snowy from over a mile away pumping low over the water. much bigger and a threatening opponent. Snowy Owl vs. 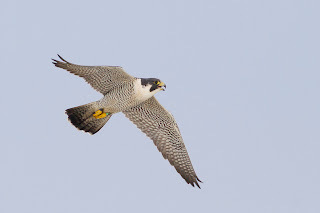 Peregrine Falcon from Tom Johnson on Vimeo. What a show! 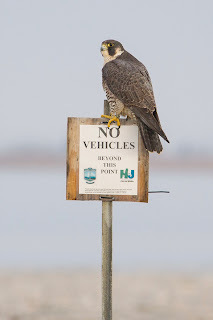 This happened every morning at Stone Harbor Point the past few days- perhaps this is why there's a Snowy Owl now at a less exposed spot at the base of the toll bridge to Nummys Island perched on a boat. But is it the same bird from Stone Harbor Point? The chain of events and arrivals of birds in Cape May have been nothing short of complicated. Sometimes a timeline helps so let's have a go at it, shall we?! 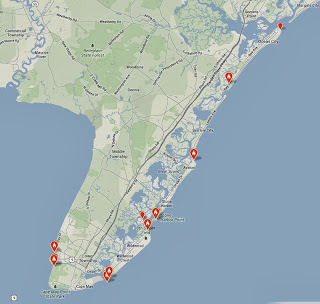 Current distribution of Snowy Owls in the county. 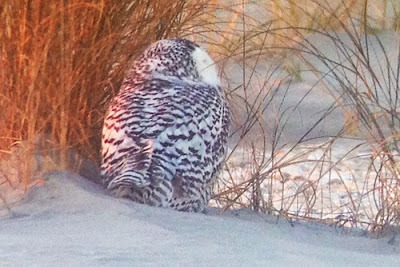 12/05 - North Cape May bird moved to Stone Harbor Point! That's right! Michael O'Brien photographed the North Cape May Snowy Owl on 12/4 and Tom Johnson photographed the same bird at Stone Harbor Point the next day 12/5! The main marker between the two here is the cross on the back of the head. Continued efforts to pin down how many birds are here and passing through will allow us to better understand the magnitude of this flight. We'll see what the future will hold! Well, the prediction of a Snowy Owl for Thanksgiving certainly came true - and the wonderful run of Snowy Owl sightings looks set to continue. Trying to find time to work out how many we have in South Jersey is proving difficult simply because news of new birds just keeps on coming! To date, the minimum number of birds in our neck of the woods seems to include three or four at Brigantine/Holgate, one at Barnegat Light, one in Gloucester County, one or perhaps two around Corson's Inlet and at least four different birds at Stone Harbor - and even as I write, news just came in of two flying south past the Avalon Seawatch, one of which landed on the 8th street jetty. How much overlap there is between sites we won't know until we can get time to properly study photos of all birds from all angles so I would encourage as many people as possible to send photos to CMBO to help us make sense of all these sightings. 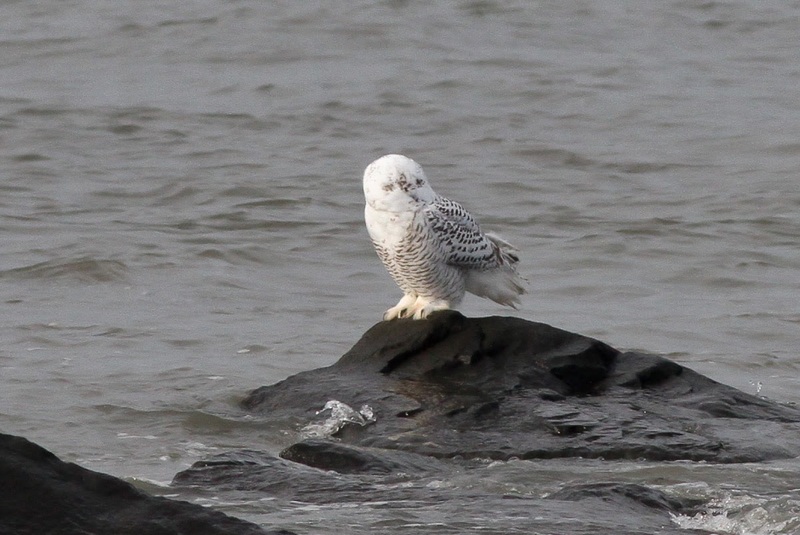 As time progresses, owls are being reported from more and more locations along the eastern seaboard; yesterday, Newfoundland birders co-ordinated a count and came up with 138 Snowy Owls in the SE corner of the island - what an awesome total!! While at the southern end of the coastline, individual Snowys have reached Cape Hatteras in North Carolina and - believe it or not - Bermuda! One thing that should be mentioned here is a word to allay fears. 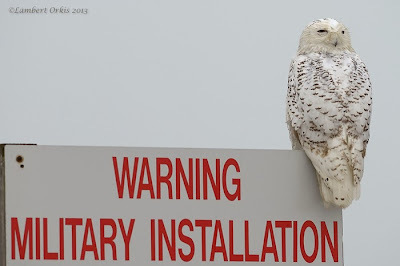 For many years, it was always assumed that irruptions of Snowy Owls like this one - which are actually not that unusual - are an indication that the birds are starving and that the movements are indicative of a crash in the lemming population. In actual fact, for some years now, researchers have been indicating that movements like this are more often a result of a really good breeding season for the owls (probably due to a good lemming year) and the movements almost entirely involve first-winter birds seeking good hunting grounds elsewhere. It may be some time before we find out why this is happening - and maybe we never will - but for now, let's just enjoy these spectacular birds and hope that we get 138 at Stone Harbor Point!! 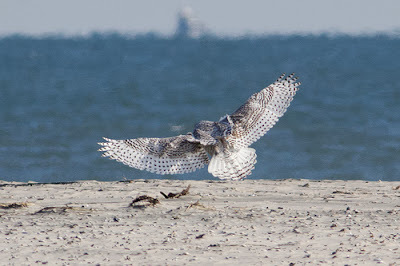 Here's some pictures from Stone Harbor, taken this weekend and showing details of the three birds that were there - a female on Saturday and two males on Sunday. 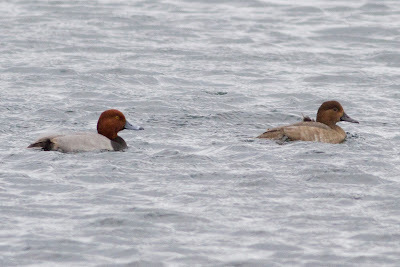 Neither of Sunday's males were the same bird as was present there earlier in the week. I still haven't managed to clap my eyes on a female, but this bird was at Stone Harbor Point on Saturday and is clearly a female - and most likely a first-winter. Note the well-barred pattern of the tail and tertials and the heavy black marks on all the upperparts. The tail pattern is difficult to see here, but the central feathers appear to have at least four bars on them, with the marks almost continuous across both inner and outer webs of the feathers [photo by Tom Reed]. The same bird as above, Stone Harbor Point, November 30. Again, a typical female; note the heavy barring on all but the face and note how small the frontal bib is on the top of the chest. Many of these features in isolation are not necessarily conclusive, but all together we have a pretty certain female here [photo by Sam Galick]. A third picture of the same bird above, Stone Harbor Point, Nov 30. The tail pattern is easier to see here and shows two more or less solid bars and two broken ones on the central tail feathers - indicative of a female. Note also here that the barring on the inner primaries appears to be more or less evenly spaced along the length of the feather; though I have not read anything about primary markings in Snowy Owls, a heavy session on the internet last night, studying what appear to be reliably labelled photos of Snowy Owls, suggests to me that males typically have the dark marks on the primaries concentrated toward the distal part of the feather, leaving an obvious pale patch at the base of the primaries [photo by Sam Galick]. The first of two birds that I saw at Stone Harbor Point on December 1. Somewhat unexpectedly, this bird was in almost the exact spot as the bird I saw earlier in the week and it would be all too easy to assume it is the same bird. The relatively large, white, frontal bib, relatively narrow dark barring and smudgy marks on the greater coverts all suggest a first-winter male, like last week's bird [photo by Mike Crewe]. But here's the same male as above, in a different position. Last week's bird had two and a half dark bars, broken into isolated spots on its central tail feathers. On the one central feather that can be seen here, there is clearly just one dark bar, formed by two, well isolated, dark spots [photo by Mike Crewe]. The second of two birds at Stone Harbor Point, December 1. This bird is one of those inbetweenies that can be hard to call, but I'm sticking my neck out on it being a young male. The smudgy marks on the greater coverts certainly suggest this is a first-winter bird, while the tail pattern suggests a male. This bird was roosting on a log on the tidal mudflats, so was guaranteed to have to move at some point [photo by Mike Crewe]. With the tide getting higher, the bird lifts its tail and makes it a little easier to see - now we can see three, rather small bars, made up of isolated dark spots - a typical male tail pattern [photo by Mike Crewe]. Having moved from the incoming tide, I got a chance to photograph the front of this second bird, and it certainly shows a typical male pattern - fine dark barring and a relatively large, white bib. Note the heavy, dark crown spotting on this bird which is very different to the other two males [photo by Mike Crewe].